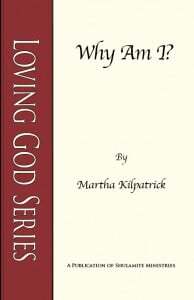 Booklet 4 of 6 in the Loving God series. In this teaching, Martha reveals the secret of our existence in God’s love, and within that, meaning of it all. Why Am I? is now available in both print and digital format. Here we are… We exist. We live. We are placed on this earth for an eternal purpose, not for a temporary reason. There is a meaning for your existence and somewhere in every man is the quest for that meaning and a knowledge that it exists. I talked to a missionary to Russia and he told me about an eighty year old woman who asked to speak to him. She said, “For seventy years I have wanted to know why I am here.” And he marveled at that. For seventy years she had waited to find out why she was here. He asked her why she did not give up hope and she said, “I knew there was a reason for my existence.” She was true to the inner drive in her that wanted to know why she was here. We really believe that we are here for our roles: wife, mother, husband, provider, worker, servant. We see the meaning of life lying in our roles and our duties. We see the meaning of our existence as practical and in this world. If we see a little further, we might say we live to serve God. But for the most part, we are a mystery to ourselves. And most people live and die and never solve the mystery…never unlock their own purpose. God IS love. The scripture says He IS love (1 Jn. 4:8). Love is not an aspect or an attribute of God—it is who He is. He is love. It is His essence and His nature. And He made the world for love. He made everything that is made for love. YOU were created for love—and the fundamental, primal meaning of your existence is to love. It is your destiny, your purpose, and your fulfillment. And without love you will have no destiny, no purpose, and no fulfillment. You need to love God. Please understand…you need to. It is your fulfillment. God wants your love. He is inscrutable, and untouchable, and unknowable, but He is a being, a personal being. He is so love that He must have an object to pour it on. He needs your love and He needs you to let Him love you. He needs a place to put His love. Let it be you! Love made you. Love made you for love and for nothing else. I saw yesterday that if you love, that is all there is! There is nothing else, really, that matters. Everything works and functions only by and in that love. Faith works by love (Gal. 5:6). The goal of Paul’s teaching was love. I remember when I saw that and it pierced me because my purpose for teaching was to give knowledge. Isn’t that why you teach? To impart knowledge of God? But Paul’s motive for teaching, and his object in teaching, was love. But I kept feeling this nudging, “Ask him! Ask him!” So finally I said, “Charles, how do you increase your faith?” He said, “Increase your love because faith works by love. The more love you have, the more faith you will have. And if you don’t have love, you will not have faith.” Oh, I didn’t get a typical answer! You were created to love God with all you are and all you have. And if you are not in that, you are not fulfilled, no matter what you are doing. Your children will not end up being your fulfillment! Neither will your marriage, nor your job, nor your career, nor your church, none of these! At the end of it all, you will be empty. No matter what you think will fulfill you, no matter what fantasy or dream you have, you have nothing until you have love for God, because it is that for which you were created. We are busy trying to make something happen, make somebody love us, but the end your restless quest is going to find its purpose when you come to love the Lord. I read a wonderful Russian story. It is called The Death of Ivan Ilych. It built very skillfully this man’s life and its total emptiness. Everything about his life was empty. His marriage was totally meaningless. His work had no merit. When people found out he was dying, all they cared about was to get his job. He had made no friend. He had no significance to his life, nothing lasting. And the story tells how, as he sank into his death, he began to love God and no one knew it because he was unable to speak. And the story unfolded his dying as pure ecstasy of the love of God. See, no matter how empty your life is, to discover the love of God is to have lived. And to not have discovered the love of God is never to have lived no matter what the accumulation, no matter what the accolades. It is all about loving God. Everything is about love, and behind everything is the mystery of love, and love is the reason for it all. Love is the beginning and love is the end, and love will be the culmination of everything. And all things will be summed up in love. And when we see through that glass no longer darkly, we will see that it was about love all along and only love. I can tell you why the universe exists! I can tell you why you exist! Love! Love made it all. Love made you…to love you! You were created because of love, and you were created for love. And everything that is, is because of love. You love God if you love your life. You love God if you love how He made you and where He put you. And if you do not like any of that, you don’t like Him! That is one measure. If you don’t like how things go that you can’t control, then that is the evidence that you don’t love God. All He has given you and all He has done to you and for you has behind it the motive of love. The meaning may be hidden, but all of it is love. The worst of your life has behind it, the motive of love. God’s love is hidden in your suffering. God’s love is hidden in the sovereign choice of how He made you and where He placed you. God created you in the womb and then He formed you in life, like the potter forms the clay with his hand. Life has formed you into something and God has given you a life that is love. None of us like our lives because we really don’t like God. But that is how you measure your love of God. And that is how you measure your reconciliation with Him. That is how you measure your acceptance of Him, and your faith in His love. You measure it by how you like yourself, and what you have got to conquer, by where He put you, and by what He didn’t give you. In the secret recesses of the closet of our heart, we measure God’s love by what He withheld. So…if you don’t like God, you are sunk. You will never solve the mystery; you will never find the secret of you. And you will never unravel the tapestry of all the weaving of your life, intricate and hidden. You and I need to love something more than we love ourselves. It is essential that you love something more than you love yourself. Because what you love, you do die for. You give up yourself for what you love. The man whose love is his career gives his life over to it, but he does it for love. The woman who lives for a man gives her life up for him, because she wants his love. She loses her identity and self to do so. So you do die for love. God didn’t ask us to love Him enough to die for Him because that’s unusual. That is human! You obey what you love, and you die for what you love. Therefore, it is essential that your love for God be total and that you be moving toward that totality, because you will die for that love. Furthermore, you become just like what you love. Do you love a dog? Do you love money—green and wrinkled? You are like what you love. If you love God, you will do for Him what you would never do for yourself, what you wouldn’t be able to do—IF you can get the love of God for you, in you, and His love in you for Him. You will do for God what you could never do for any person. The love of God will supply you everything God requires of you, and only the love of God will give it to you. Only love for God will enable you to live the Christian life! You will only go for love. You will only obey if you love. And you certainly will only die…if you love. One of my heroes of the faith is Esther Ahn Kim. Her story is written in the book, If I Perish. I have listened to her testimony on tape. Esther Ahn Kim’s testimony is really of her mother’s love for God. Her mother raised her to love God and to give herself completely to Him. Esther Ahn Kim was called to go to Japan in the 1940’s as a young Korean girl. God called her appear before the Japanese parliament to warn them about the atom bombs. What she said was, “If you don’t repent of your evil, judgment will fall from the sky in a fireball and destroy cities.” She did not know the word atomic. And, of course, they arrested her. Esther Ahn Kim’s mother trained her, “Now Esther, when you go into prison, beg them to take your life. Because if you lose your life, you will save it. Tell them you want to die for Jesus,” and so she did. Every time she was hauled up to be grilled, tortured, and interrogated, they would say, “We are going to kill you if you do not renounce your God!” and she would say, “Kill me, it would be my joy!” And they would send her back to the cell. But Esther Ahn Kim’s base and core and essence was love for God. Once they brought an insane, pitiful creature into that prison covered with excrement in her hair and all over her body. No one would touch her or get near her. But Esther Ahn Kim picked her up in her arms and rocked her to sleep and held her for hours, brought her back to sanity, and led her to the Lord. You don’t do that for any other reason than love of God! Esther Ahn Kim’s mother had a heart to be martyred. She loved the Lord enough to want her life taken for Him. She begged the Lord to let her die for Him. She said, “I am worshiping my Lord Jesus.” They immediately fired two bullets in her chest and she died. That is what she wanted. I do not see such love for the Lord! I do not see it and it shames me. Esther Ahn Kim’s mother raised her daughter to love the Lord above everything and anything, and to give her life, if necessary. Another hero is Haralan Popov, who wrote Tortured for His Faith. Popov was placed before communist interrogators and questioned for hours until his legs swelled to the size of an elephant. His torturers said, “All you have to do is renounce Jesus and we will let you go.” Yet He would never do it. He was tortured unendingly. She said he turned and looked at her as if she were crazy, and said, “I love Him! I love Him…” Only love made him endure. Only love will take you through to your destiny. We are caught up in loving ourselves. We are caught up in our desperate need for love, and it is real. Our need for love is real and it is very desperate. But we need more than anything else to love God. When that connection is made, you will LIVE. In all your being, in all your life, your adventure will be loving God. Your significance will come from loving God. Your eternal destiny will come from loving God. He is longing to love you and to be loved in return. That is what you were made for—everything else is secondary.